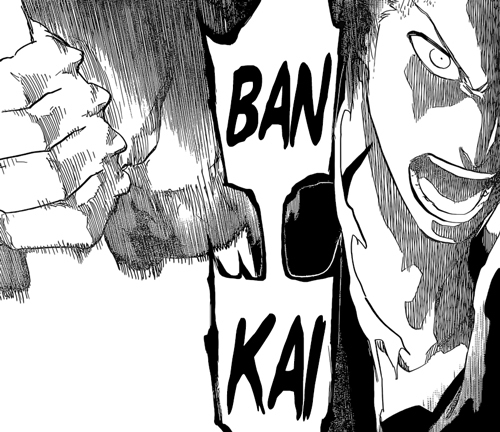 Bleach 677 – Ban… kai! These past few chapters have been fairly simple, but a whole lot of fun. And this one is no exception. Even though the content this time is either Juha rambling on or him and Ichigo clashing swords, it still made for a fun read. Kubo has a bad habit of turning his villains into rambling lunatics before they eventually get cut down, but there does seem to be some coherency and confidence in Juha’s words, though once you pair that with his ridiculous many-eyes form it does make him seem a little less human than we’re used to. At the very least the dialogue this week clarified how exactly Juha can see the future, and it turns out he sees many version of what could happen as if they’re all grains of sand. It’s interesting that there’s not a linear measure of time here, but rather several version of events that could unfold. Like Ichigo, I just wonder what the big flaw in this overpowered ability is. Juha finally going all out. Speaking of Ichigo, he was pretty cool this week. He’s remaining level-headed even with Juha using not one but two swords against him, all while spouting out his supervillain speech. I liked that he was able to remain determined until the final page when he released his bankai, which is a pretty exciting place to leave us waiting. We’ve seen Ichigo use bankai so many times over the course of the series, but we have no idea what his new form will be and what new abilities it will have (if any). Considering he’s still got his hollow horn and is now using his quincy blade to fight we could be in for some blend of all three abilities, which would be very cool. In my head Ichigo’s bankai will look similar to his final Getsuga Tenshou form, with bandages around his body and his hair longer and black, but with Kubo anything is possible. Another simple battle chapter. Juha keeps on rambling, but spills some useful information in doing so. Ichigo going bankai at the end is a big tease, but I’m sure everyone is at least a little curious to find out what his new final form looks like. I know I sure am, but I’m a self-confessed Bleach fan, and we’re reaching the final stages of this arc, so pretty much everything at this point has me excited. I imagine the big flaw being that there are always possibilities where he doesn’t win. He’s confident in his ability to cut off the path to those by restricting Ichigo’s choices. But I bet there are a couple of routes that have a very low probability that will be taken anyway. 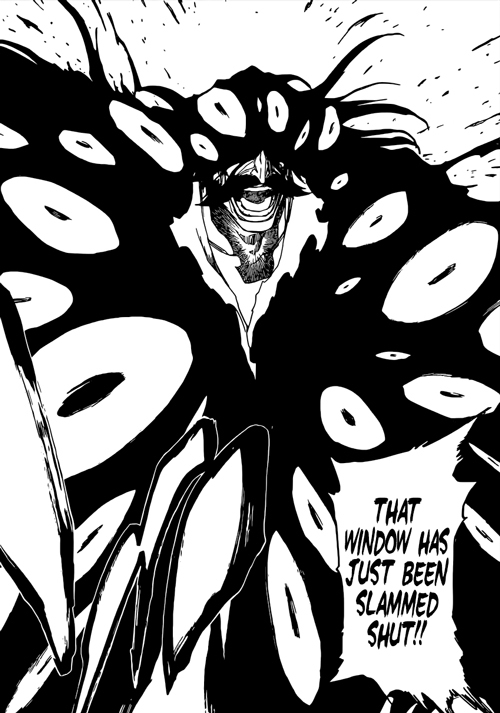 So Ichigo’s using Bankai before Yhwach even began to transform. Unless Yhwach wants to lose, Ichigo’s not going to win this one. So is this the “final” final battle for Ichigo? I mean, if he loses, couldn’t he just reflect on the loss, get stronger and face him again? That’s probably what’s imo gonna happen. Ichigo will loose and Isshin will save him. Ichigo and his friends and whomelse Kubo deems important enough will escape while Isshin stalls Yhwach, dying in the process and using Bankai and FGT. Ichigo will then use the remaining seven/days days to train and stop Yhwach during the invasion of the world of the living. I think you’re right. It would be a great bit of character development to throw Ichigo into despair, only to rebuild him stronger and ready for the actual final battle. Ichigo kicking despair in the teeth once again and overcoming it as he activates his new bankai. I imagine its probably something like True Tensa Zangetsu since he is wielding his true Zangetsu so I would imagine his bankai wouldn’t be that different. Knowing Kubo tho, next chapter will cut away from Ichigo and return to the fight againts Gerald or Rukia and Renji arriving to help Ganju and Sado. So maybe we wont see the bankai next week. Ichigo is in a huge pinch right now. I’m tempted to quote Star Driver after so many years. I’m a bit confused at the moment… in the previous chapters Ichigo explained that his powers need to be balanced for him to become as strong as he is now, so both shinigami and quincy powers need to be balanced, see it as yin and yang, but Bankai which he’s using now is a shinigami power, so he’s boosting his shinigami powers. so won’t this create an unbalance in his overall power? sure, I’m psyched that Ichigo is using Bankai, but I also really want to see Ichigo step up his quincy power aswell. Ichigo’s Hollow powers are his Shinigami. That Ichigo could transform was proof that the balance shifted towards one side. Technically Ichigo would be able to shift the balance towards the other side, but he has yet to actually master doing that. Ichigo didn’t have much oportunity to learn to use his Quincy powers very well, which is also why I think he won’t defeat Yhwach right now. Ichigo is probably going to use most of the remaining seven days to proper learn how to use his Quincy powers, and maybe how to utilize those special Quincy powers and fight Yhwach on the final ninth day, when he tries to reclaim the world and invade the world of the living. Ryuken, Uryuu, Ginjou and depending on the circumstances Haschwalth could all teach Ichigo in the Quincy ways. Her power is not jumping back in time. It was denying whatever happened an object or something like that, I believe. Juha: I can see the future and every thing you will do Ichigo. Ugggh. Oh my gawd. He can see Hypertime. I called it, and it’s gonna be bull crap. How the hell can Ichigo win this? He can’t. Ever. If Juha Bach can see the infinite number of possible futures which are not countable, like infinite googolplex times infinite googolplex on repeat, all he has to do is make the choices that give him the most advantages and Ichigo the least number of advantages. For the people here on planet Earth. Ichigo cannot win this fight. But in Bleach world, and Kubo world, I guess he’ll win even though the chances of that are….there’s not even a word….there’s not a word that exists that describes how screwed Ichigo is. The only way, and I mean the only only way Ichigo could win is if somehow he can manage to hit Juha Bach to turn that power off or to steal that power from him. He can’t “Win” against that ability, I don’t care who he is or what show this is, no character can. This possibilities of different futures, are all fixe timelines, just countless paths. What if someone can jump back on these timelines, or jump between them? Someone? Are you referring to Inoue? I don’t think she can do that, or Ichigo. The only one I know who can do any time alteration is Tsukishima, but he can only insert “himself” into his target’s past. So for fun, if Inoue can somehow use her rejection powers to pick the right timeline, Juah Bach would be able to “foresee” that future, so he wouldn’t let it happen, or he’d make a decision that changes the branch in his favor. That’s what I’m saying. He can foresee every possibility, and if he can do that he can then make a decision to counter Ichigo or Inoue’s decision that prevents Ichigo from winning. So he can always pick the branch that give him the victory in the end. Following that logic, both Inoue and Ichigo could still move towards a future more favourable for them. As the possibilities are endless. Do you think Vizards can achieve a similar form if they find balance between hollow and shinigami powers? Doesn’t their mask represent that? As they have access to both powers. Maybe his final form would look more Quicy-like (as in shining with a reiatsu cape?) than Hollow/Shinigami. Juha’s power is kinda similar to a Mistborn while burning atium. “That window has just been slammed shut”… is that the best the translators can come up with? Honestly, they need to take a Japanese translation class.